Commissions are what portrait painters are all about. Every time I receive a commission, I feel so proud to have been chosen and know that I will get it right. What I don’t know is how long it is going to take for me to get there. I received my first commission when I was 14 years old. A man wanted me to paint his fiancé, who was a nurse, as a surprise wedding gift. He gave me her photograph and it took about a month for me to finish it. I’ll never forget his look of surprise when he looked at the painting and said, “It looks just like her.” He paid me $40.00 which was about 30 hours of babysitting time and I was on my way to becoming a professional portrait painter. The outdoor portrait has always been my favourite, as I love to add the life of the land to the life of the person. My largest commission was to paint three 32” x 69” portraits of the three prominent people who had ensured that the Center for Diabetes Research was built at the University of Alberta: Dr. Lorne Tyrrell, Dr. Joel Weiner and Dr. Jim Edwards. My most surprising corporate commission was to paint the late D’Arcy Duncan, QC , for the boardroom of the lawfirm Duncan & Craig, without a tie or a jacket. Corporate portraits start at $5500. Technically, this portrait of Jim Shaw, non-Executive Chairman of Shaw Communications, was partly a project and partly a commission. While finishing my High Tea series of 22 prominent Canadian women, I embarked on Men with Pens. The concept was the same- paint the subject’s hands this time holding a pen rather than a tea cup, chose prominent Canadians throughout Canada in all kinds of professions only this time they would be men. And depict the men without their faces, as I had done with the women. As I had been previously commissioned to paint portraits for the Shaw family, I knew Jim Shaw and thought of him immediately when embarking upon my new project. He agreed and asked to be painted on his motorcycle. First I declined, then I relented and asked to photograph him in his home and office as well as on his motorcycle. We decided to let the photographs decide which was the strongest image. 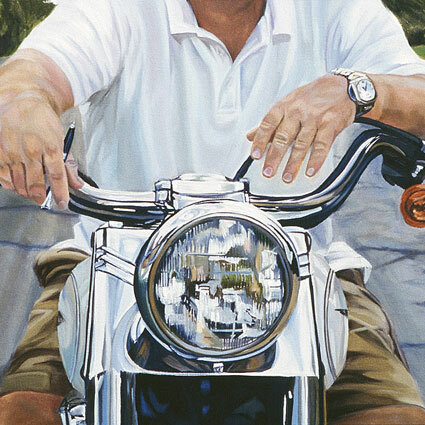 On his Harley, the man looked relaxed and assured and so I painted him as such. Only a few portraits of Men with Pens were completed- Atom Egoyan, Bernard Callebaut and Raymond Moriyama were the others. The surprise was that I enjoyed painting chrome and leather and the feeling of being on the bike so much, that this portrait launched four years of my painting in the genre of motorcycle art. The lawfirm Duncan & Craig commissioned me to paint Duncan & Craig for their boardroom. I was excited until I heard that D’Arcy Duncan had no intention of having me paint his portrait. I simply took that as a challenge. We met, we talked, we laughed and then he asked me how I worked. I told him that I worked from photographs as no one had enough time to sit for the number of hours that I would need to paint their portrait. He told me that since the firm wanted this done, he would let me take a few photos. But in no way, shape or form was he going to wear a suit and a tie. I took this as a challenge. How to make a corporate portrait without the corporate clothes. The view. Only a senior partner would have a view like he did in his office and so I placed him on the inside ledge of the window and had him stare out at his coveted view. This is one of my favourite portraits. This portrait was commissioned by the Calgary lawfirm Parlee McLaws to level the playing field in the boardroom. A portrait had been painted some time ago of Mr. Parlee but none had been painted of Mr. McLaws. I was thrilled to receive the commission as having written the LSATS and nearly becoming a lawyer myself, I love to be around lawyers. However, I became totally anxious the minute that I saw that Don McLaws had no hair. I had never painted a bald man before and wondered what painting style to employ in order to minimize the fact. I chose broad, bold strokes that almost abstracted the face to make it so painterly that the method became as equally important as the subject. And I chose to give the hands a prominent position so that they also would speak to the power of the man.